Award-winning bareMinerals® MATTE SPF 15 Foundation gives you all the flawless coverage you want and lasts up to eight hours. Lightweight minerals buff on beautifully, absorbing excess oil without drying out your skin. This versatile weightless foundation provides adjustable sheer-to-full coverage for a flawless look, yet doesn't feel like you are wearing any makeup at all. Formulated without preservatives, it's powered by ActiveSoil Complex, clinically proven to minimize the appearance of pores in as few as four weeks. three colors availabel : fairly light:N10 ,fairly medium:C20 ,medium beige:W20 . please indicate the color you want in the comments when you check out . 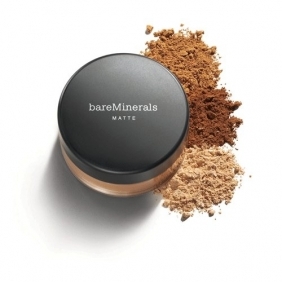 description:Award-winning bareMinerals� MATTE SPF 15 Foundation gives you all the flawless coverage you want and lasts up to eight hours. Lightweight minerals buff on beautifully, absorbing excess oil without drying out your skin. 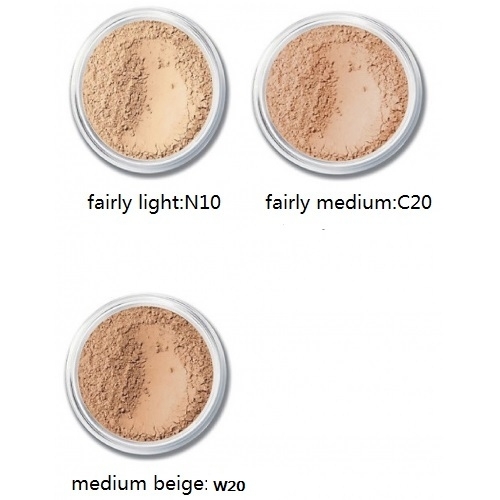 This versatile weightless foundation provides adjustable sheer-to-full coverage for a flawless look, yet doesn't feel like you are wearing any makeup at all. Formulated without preservatives, it's powered by ActiveSoil Complex, clinically proven to minimize the appearance of pores in as few as four weeks. Pretty good.Come in three weeks.glitter give excellent. was packed well, it's all safe and sound.